I decided to join Facebook for two reasons. First, I wanted to have a link to my third son as he left for college. Funny, I didn’t feel the need for the older ones… The decision to send him to the University of Iowa to study music was a difficult one. We were between Iowa and Illinois and, to be honest, every time we’d make a “pros” and “cons” list for the schools, Illinois always came out as the obvious, prudent choice. But, we sensed Peter was leaning towards Iowa and when he would tell us that he thought Illinois was the one, we knew it was because he was thinking more of our finances, which, hello….should be considered…than his true desire. It was only when my husband said, “Peter, if money was absolutely no object, where would you like to go?” (these words spilled out of his mouth before I had time to fly across the room and kill him), that he said “Iowa”. So, the decision was made. Our two older sons had attended and have since graduated from the University of Iowa, so we were well-acquainted with Iowa City and the Hawkeyes. Our car could drive there on its own (and sometimes, I think it did). But, Pete was studying music, and you can’t just transfer Universities if you’re in a music school. So, the decision seemed permanent. Of course, with that kind of unease, I thought I needed a little reassurance that he was happy and thriving at his new school. At that point, though, I was still all talk. It wasn’t until I learned that the high school our boys attended had gone Facebook. This is a small, Catholic school run by monks. These are not people you would think are on the cutting edge of technology. But, here they were telling us to “like” them on Facebook. That was it, I thought. I am not going to be the last person on earth to not be able to read the hourly minutiae of the lives of other people that I barely (or absolutely do not) know nor care about. No, I decided I had to become “one of them”. So, one Sunday afternoon, I sat down at the computer and opened an account. My kids were out for the day and that evening, Brian walked in, stood next to me, arms crossed and tapping his foot as though demanding some sort of explanation. “So, you’re on Facebook now?” he asked, incredulously. Aghast, I whispered, “How did you know?” “Mike told me.” “How did he know?” My God, my world was imploding. Isn’t this every parents fear: that everyone will know you’re on and checking up on them? I was told that no alert would be sent out. That I was safe in my anonymity. Obviously, everyone lied to me. It was a huge conspiracy. And, let’s not even talk about how many times I had to ask her, “So what is the news feed again? Is that what everyone sees? Well, if I write something, who sees it? What’s my home page?” She was ready to hide my computer. And, Brian thought it was hilarious to change my language to “Pirate” so everything that came through on my Facebook was translated into pirate talk. Plus, he added a bunch of athletes to my list of friends who had waaayyyyyy too much time on their hands as they went on and on about training camp, ad nauseam. When I told him to change it back to normal again, he said, “Mom, if you can’t figure it out, then I don’t think you’re ready for Facebook.” HAH…I showed him. I finally DID figure it out (and learned a new language in the process) and now am not subjected to the boring antics of Chad Ochocinco spewing on in Piratese about the weight room. Talk about weird. 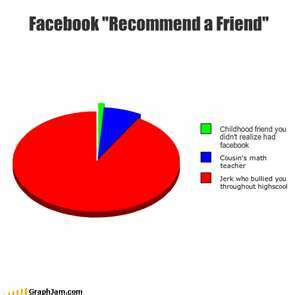 With a scant two friends, I was beginning to feel like a complete Facebook failure. So, I went ahead and friended a million people. Well, seventy-nine. And, I have to say, I get it now. Facebook is a whole lot more fun when you have some friends. Prior to adding my glut of friends, I was reduced to “creeping” on my kids’ and their friends’ pages (“Oooohhhh, I never liked that kid. Wonder what he’s up to?). That actually got boring pretty fast. I mean you can only read, “studying :/” or “babysitting…text me” so many times before concluding that kids today basically have nothing to say. So, now, I am “one of them, one of them…” and I get to read about and contribute to the unsolicited minutiae of the lives of people I only marginally care about.